Official iOS 10 Tips and Tricks Thread! Heeeey everyone! Thought it'd be fun to share iOS 10 tips and tricks right here for everyone to see (and add to). What are your favorite tips and tricks? Share 'em, and help us all get the most out of iOS 10!! libra89, aximtreo, SprSynJn and 1 others like this. 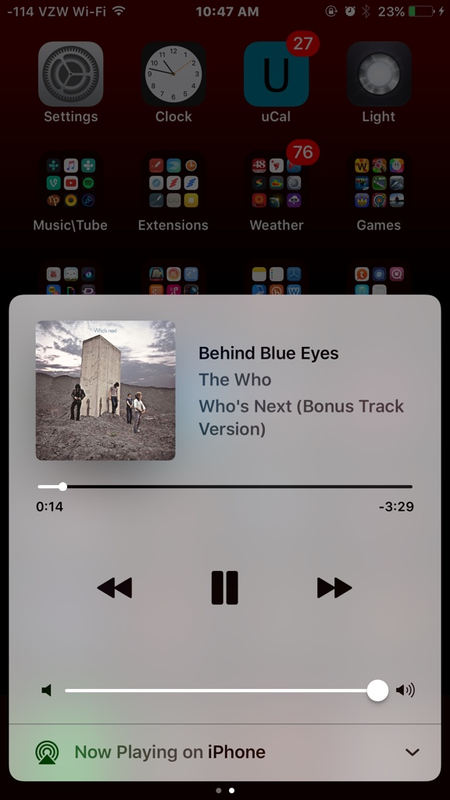 I've seen several complaints about the music controls on the Control Center being a slide over. They want to pull it up and it be right there. Then the next time you pull up the Control Center, it is already on the music controls. This works until you reboot or reset. Annie_8plus, libra89 and nikkisharif like this. Tip: Install the iPhone User Guide for iOS 10 to your phone. Great for those either new to iPhone or not yet familiar with iOS 10. Note: I couldn't find it in the store on my phone for some reason. I had to install it via iTunes. aximtreo, Judge Joseph Dredd and nikkisharif like this. Hmmm. I was able to find it fine in the iBooks app on the iPhone. It was the first thing that popped up when I searched for "iPhone user guide". Mine updated version 9 to 10 when I opened the app for the first time after updating to iOS 10. 3D touch in the control center. The 3 levels of flashlight brightness has been shockingly useful. Finally Apple is making better use of the force touch! rdstryr, Sherry_B and nikkisharif like this. 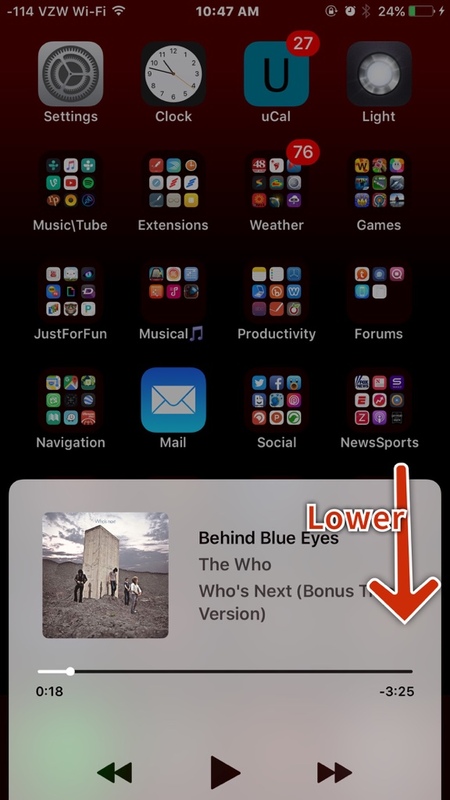 For people having trouble adjusting brightness in Control Center (e.g., accidentally swiping over to music controls instead of adjusting brightness), put your finger on the brightness toggle and wait for the screen brightness to change a bit before moving the slider. Then you'll know you're in the editing mode. This has been a lifesaver for me when I need to sneak into my bedroom at night but my 6 month old is asleep so I can turn on any lights. Before I got my 7+ I'd have to go in with full flashlight on the 5s, now I can use "low light" and not disturb him. is the iPhone user guide by apple or a third party? They update to the current OS automatically. Old link, but should update. dannejanne, nikkisharif and SprSynJn like this. I had no idea this was a thing, thanks for bringing this to my attention. DarlaMack and DLieSaS like this. You can get nested folders (folder in folder) in Notes app. Drag a folder in mac os or iclou.com and place it above another folder. It will appear on iPhone as well. You can change a density in a day view in calendar app. Just pinch in and out on screen. doogald, rdstryr and dannejanne like this. I could not figure out how to get this to work, I kept trying to 3D Touch on the app in the updates section rather than on the actual app icon on home screen. LOL it was driving me crazy then I saw how to do it on an article about 3D Touch secrets. And double-tap to go back to the standard density. Tartarus, doogald and rdstryr like this. IOS 10 letting you copy and paste content across devices. Stop SMSing yourself that crucial bit of text or photo. It makes sense for content to live on multiple devices via the clipboard, and thats what will happen with iOS 10 and macOS Sierra. So this will certainly be on the top our iOS 10 tips and tricks. Apples QuickType keyboard now understands context. What that means is that, for example, if a friend asks where you are, the keyboard will realize that and suggest you send location data, which youll be able to do at the tap of a button. Siri is basically becoming a part of your keyboard. In fact, the keyboard will learn new works as time goes on, so if you type anything it will realize not to change. It will also know when you might want to schedule something in your calendar. All in all, your keyboard is going to become a whole lot more helpful. QuickType proactively gives you information it thinks youll need, so youll no longer have to look for it yourself. Contacts and your location are just one tap away. Until now, to access the camera youve had to slide from the bottom corner up. Now youll be able to swipe from anywhere on the screen right to the left, which will automatically pull up the camera. Its a much bigger gesture target. Apple understands how important quick access to the camera is thats why it included camera access from the lock screen in the first place. This update should make taking a snapshot that much easier. You wont need precision to get to the camera app as soon as possible simply take your phone out and swipe to it. When you are browsing a web page in Safari on the iPad you can now open up two pages next to each other. Press and hold on a link and then choose Open in Split view launching two web pages next to each other. You can use each page independently. Its awesome for comparison shopping. When you pick up your iPhone, you can now see all your notifications without pushing a button. Raise to Wake is on by default, but you can turn it on in Settings -> Display& Brightness -> Raise to Wake if it isnt already working. This allows you to quickly see your new notifications without pushing the home button or power button. With iOS 10 your iPhone knows when you get out of a car that has been driving and then marks the spot in Apple Maps. Youll see a notification on your screen showing where your parked car is at. With iOS 10 there are new 3D Touch features or Notes. One of the best is the 3D Touch Quick Action that allows you to create a new checklist. Whether you use this to make a daily to-do list or use it to make a grocery list every few days its an awesome addition. This is only available on the iPhone 6s, iPhone 6s Plus, iPhone 7 and iPhone 7 Plus. iOS 10 now lets Siri tell you who is calling you. You can set this up to happen all the time or simply to have it tell you when you are using headphones or connected to the Car. Go to Settings > Phone > Announce Calls Choose when you want to hear a caller identification. Now that Siri connects with third party apps you can use Siri to hire an Uber. You need to install the app, sign in and be completely set up. From there you can say Siri get me an Uber to a location, or get me home in an UberX. Siri will show you the time and other important details and then you can request it. You also need to go to Settings -> Siri -> App Support to turn this on. You can tell Apple Maps your preferred method of travel in iOS 10. This is an awesome addition for anyone who walks or takes public transit instead of drives. Go to Settings -> Maps and then choose the option you use most. About 10 to 30 seconds after someone leaves you a voicemail in iOS 10 youll get a transcription of it in the Phone App. Go to check your voicemail like you normally would, but instead of pressing play, you can read the voicemail. This is in beta, so this isnt 100% reliable, but it is good enough in many situations. You can rate voicemail transcriptions to improve the service. You can edit Live Photos in iOS 10. Now you can crop, edit and even add filters to Live Photos without losing the Live part of the photo. Take a Live Photo and tap on edit. Thats all there is to it. You can also turn off the Live part of the photo if you dont like it. Siri can look up photos for you using a variety of search options. This includes asking to see photos of a specific person, but also on a specific date or at a specific location. Hold the home button to access Siri and say, Show me photos from Hawaii., or a similar command to make this work. The iOS 10 Photos app can now show you photos of people using Facial Recognition. In the Photos app you can to Albums -> People to see people that are identified and to identify more people. You can also ask Siri to show you photos of a specific person and she will show you all the photos of that individual. You can send handwritten notes through Messages on iOS 10. These appear as a written message on the other users screen. You can choose from pre-written beautiful handwritten messages or you can scribble out your own with your finger. You can turn your phone sideways to landscape to see these options, or you can access it by tapping on the App Store icon in Messages. Tap and hold on a message inside a conversation in iOS 10 and you will now see Tap back options. These quick reply options let you respond to a message like you would a Facebook status. You can heart, thumbs up, thumbs down, laugh, share which shows up on their screen next to the message. You can speak messages in iOS 10, similar to how you could in iOS 9. This isnt dictation, but actually sending a short voice message inside Messages. Apple changed how this works in iOS 10. Go to Messages, open a message and then hold the microphone icon to start recording. You dont need to hold it the whole time. When you are done you can tap on Stop and then you can tap the up arrow to send the message. Messages expire soon after you play them. At the bottom of the Mail app screen, tap on the circle with three lines in it. This lets you filter your Inbox. By default, this will show you only unread messages. You can also tap in the center to change the filter if you need to see Flagged or if you want to only see messaged that are to you, ccd to you, with attachments or only from a VIP. When you are looking at notifications in iOS 10, 3D Touch the X in the upper right corner to clear all notifications in one go. This only works on the iPhone 6s or newer versions. The new iOS 10 Messages app makes it super-fast to send photos in a conversation. Tap on the camera icon and you can now quickly take a photo with the front or rear cameras. Slide to the right to access recent photos. Slide to the left to go to your library or launch the full camera app. Gone are the days when youll have separate apps for each aspect of your smart home now youll be able to control your entire smart home straight from the Home app. Smart light bulbs, locks, thermostats, and so on all should show up in Home, as long as their HomeKit-enabled. The Home app is likely to play a bigger role in your life as time goes on and your home gets smarter, and its release makes sense if Apple wants to be competitive in the smart home business. When you open the Music app up now, youll be taken straight to the library tab, which shows what youve been listening to recently and what you might want to listen to at that moment. That should help you avoid having to dig through your music to find something to listen to, and if youre halfway through an album that you want to finish, youll be able to get straight to it. Other changes include lyrics embedded into the app and larger fonts for easier viewability. Its all about less time navigating inside and outside the app, and more time listening to songs. emanwis and nikkisharif like this. Best iMessage apps and sticker packs for iOS 10 so far!